If we were building a dedicated home cinema tomorrow, we would, without doubt, install a 3D projector. While cynics continue to shrug at the tsunami tide of 3D flatscreen TVs heading our way, and we also have some reservations, we've yet to meet anyone who's walked away from a 3D home projector demo who didn't have a grin on their face. After all there's something completely understandable about the simple proposition of movie-watching in a dark room, with no disturbances. In this context, 3D is a killer addition to the home entertainment experience. And if we were equipping said picture palace, Sony's second generation VPL-HW30ES would be on our shortlist. 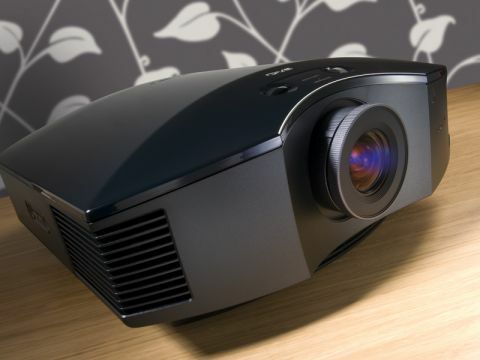 It's a breathtakingly good projector, blessed with an alluring price tag. By our reckoning, that's the equivalent of around fifty family visits to the local multiplex (including snacks and beverages). This thing would pay for itself in no time. The Sony VPL-HW30ES' design is in line with previous Sony SXRD (Silicon X-tal Reflective Display) projectors. The distinctive curvaceous, glossy lid and side-mounted inputs look suitably swish. Our test sample was finished in the standard black, but there's a new white finish available, too. There's a broad connection choice of two HDMIs, PC D-Sub, component video, RS232 and Ethernet. Yet one obvious omission is a 12V trigger. Frankly all projectors of this calibre should have this as standard. Used to integrate a projector with an electric screen, this 3.5mm jack can hardly be construed as a luxury. We're sure we're not alone in feeling a little miffed by its absence. There are other marked differences between this model and last year's VPL-VW90ES, but these seem more justifiable given the cost saving. The motorised lens protector and zoom have gone, along with the ingeniously integrated 3D glasses sync transmitter. Instead, we get a separate transmitter, the TMR-PJ1, which ties to the projector via Cat5 cable. Consequently, you'll need to give the Sony VPL-HW30ES some thought when it comes to installation, as the transmitter needs to be placed close to the screen, facing the audience. Thankfully, the imaging engine beneath the lid is just the same; the 240Hz panel delivers superb detail and colour fidelity. New this season is a Dynamic Lamp Control, which delivers three times the brightness of last year's model. This light boost makes a huge difference to 3D performance. Sony has also refined its 3D projector glasses. First time around, you needed to affix little filters to each lens; this year the new Active Shutter TDG-PJ1 eyewear is good to go straight from the box. They're also considerably lighter; Sony has reduced their weight by 18g. Even worn over prescription spectacles, they're manageable. While they have to be manually powered up to sync, they switch off automatically, preserving juice. The glasses are USB rechargeable – a 30-minute session on the ring main provides around 30 hours of use. Interestingly, the spectacles are not officially included with the projector. Like the transmitter, they're an optional extra. However, Sony UK concedes that all dealers are likely to bundle goggles and projector together as a package. Do remember to check this when comparing prices from different retailers. The motorised zoom may be missed, but horizontal and vertical lens shift wheels make for a simple setup. The throw distance is generous enough to achieve an image of 120-inches from a distance of a little over 13 feet. The remote control is also backlit, an eminently sensible provision. The VPL-HW30ES is respectfully quiet. Run the lamp on Low and fan noise drops to a gentle 22dB; this is perfectly acceptable in a cinema environment. Even during quiet scenes we weren't really aware of it.